We followed in the footsteps of long-gone celebrities on our recent, and I have to say, nigglingly exclusive visit to Wenlock Abbey. It was the first chance we have had to visit there, and it was done under the auspices of our Civic Society. Without doubt this building is the architectural jewel of Much Wenlock. It lies at the heart of the town, but is usually only visible if you scramble around at the back of the church yard, and peek over the wall. 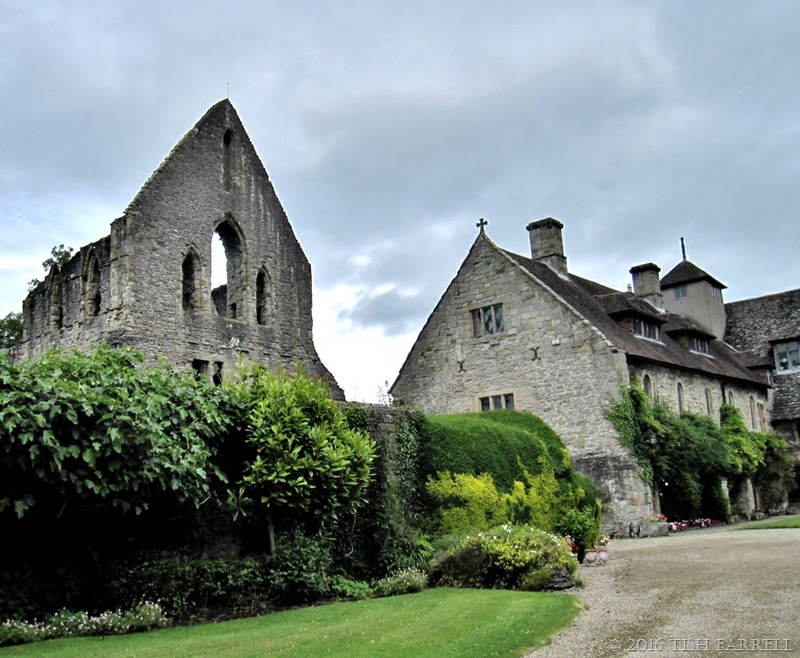 It housed the erstwhile domestic quarters of the priors of Wenlock Priory and, since the Dissolution in 1540, has remained in private ownership. The adjoining priory ruins, however, belong to English Heritage, and are the town’s main tourist attraction. Somewhat confusingly the house has long been called The Abbey, although the priory from Norman times was always a priory, not an abbey. 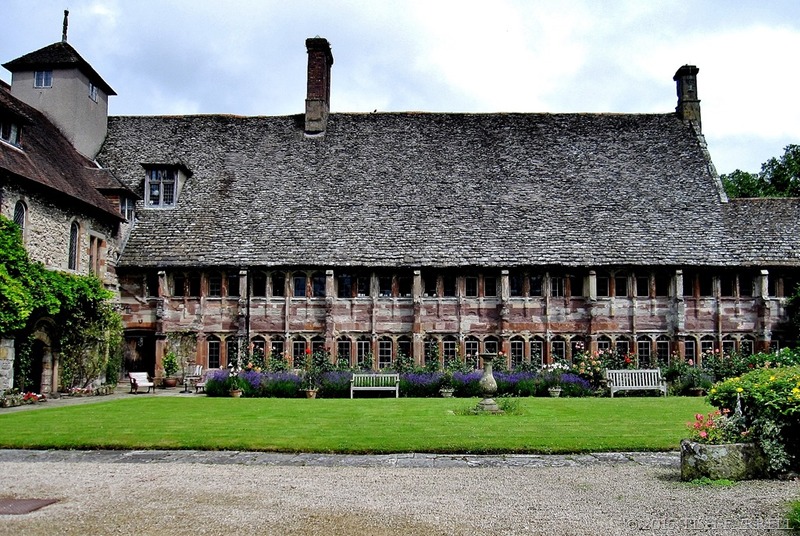 The Saxon religious house that preceded it, however, was an abbey of both monks and nuns and ruled over by an abbess. The range seen in the first photos is the most recent part of the house, built in the early 1400s. The limestone wing, just visible on the left, comprised both the monks’ infirmary and the original prior’s chambers, and are considerably older. The present owners have spent the last three decades restoring the house, and creating interior settings that to many might seem outlandish and controversial. There will be more about this in a moment. But first those celebrities of times past. I’ve written about his visits before, but one of the returning house guests in the days of the Milnes Gaskells’ ownership was Henry James. He came in 1877, 1878 and 1883 – and apparently drew much inspiration from the house and grounds when he was writing The Turn Of The Screw. The little roof-top tower certainly puts in an appearance in the text. At the time of James’ first visit, his hosts, Charles and the young Lady Catherine Milnes Gaskell, had not long been married and were expecting their first child. The invitation had been secured through ‘lobbying’ by a mutual friend, Henry Adams, the American historian. He and Charles Gaskell had met as undergraduates at Cambridge, and before Charles’ marriage he had also been a frequent guest at The Abbey. Adams thought Charles, by then a prominent barrister, and Henry James had many interests in common and would get on well; and so it proved. One of the more unusual pursuits on such visits included the archaeological excavation of the Priory ruins. When Charles Gaskell took over The Abbey from his father, he and Lady Catherine set about restoring the property and making it a family home where they might energetically entertain notables from the world of arts and literature. Emphasis was on mind-improving activity, and an appreciation of the aesthetic in all its forms. 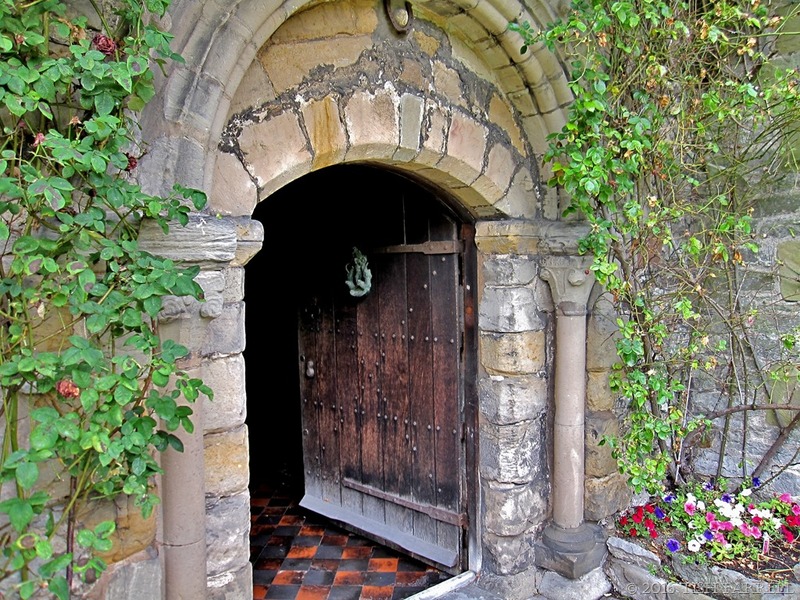 Visitors would be treated to extensive walks, drives and railway journeys to view all the surrounding great houses, and visit Shropshire’s many ancient churches and castles. A trip to Wenlock Edge to take in the vistas was also obligatory. Henry James documents his own many outings with Charles Gaskell in Portraits of Places. 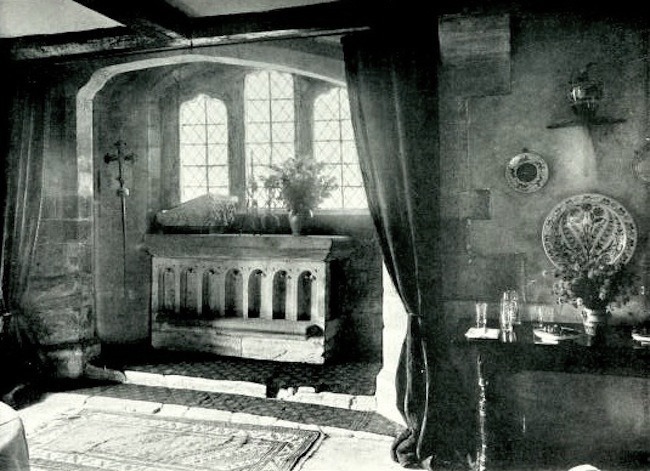 The Prior’s Chapel during the time of Lady Catherine Milnes Gaskell from her book Spring in a Shropshire Abbey 1904 (available to download on Gutenberg Press). The room wherein Hardy felt so mouldy was in the infirmary wing and is indeed very old, dating from the 1100s CE. The original prior’s chambers were built adjoining the infirmary around a hundred years later, the scale of them doubtless dictated by the need to accommodate a series of royal visits. The deeply devout King Henry III, along with his own prestigious guests, was a frequent guest between 1231 and 1241. This photo shows the rear view of the infirmary and original prior’s lodgings, (the limestone range on the right) together with the side elevation of the upscaled prior’s lodgings that were added in the early 1400s (multi-coloured stonework to the left). The galleried facade of the more recent fifteenth century lodgings,originally unglazed, was constructed from stone from four different quarries. The catslide roof is tiled with stone flags. Inside, on the ground floor, is the prior’s private chapel, while upstairs is the Great Hall with its great stone fireplace and high beamed ceiling mentioned by Adams, and next to it, though scarcely less grand, the Lesser Hall. Timbers in the Great Hall roof have been dendro-dated to 1425. I returned to the habitation of my companion (Charles Milnes Gaskell)…through an old Norman portal, massively arched and quaintly sculptured, across whose hollowed threshold the eye of fancy might see the ghosts of monks and the shadows of abbots pass noiselessly to and fro…for every step you take in such a house confronts you in one way or another with the remote past. You feast upon the pictorial, you inhale the historic. It was through this doorway we also went a few Saturdays ago. As I said, this was a private tour, and our first such visit. Since 1983 the house has been the home of Gabriella and Louis de Wet. De Wet is an artist of some renown and Gabriella is better known to the wider world as theatre and television actor Gabrielle Drake. For the last 33 years, driven by Louis de Wet’s extraordinary artistic vision, they have been restoring the house – carrying the building’s story on into the 21st century while revealing its ancient monastic roots in strikingly original ways. The project has been an epic labour of love, and involved the dedication of consummate craftsmen, working very much in the mediaeval guildsmen tradition. I did not take photos. So if you want to see what lies behind this door, please follow this next link. It will take you to a 2 minute trailer of a very excellent film made by Gavin Bush in 2011: In The Gaze Of Medusa . I leave you to make up your own minds about the merit of the De Wets’ prodigious and unique enterprise. It is not straight forward by any means. For now, here’s the one photo I did take – of the library, and still a work in progress. 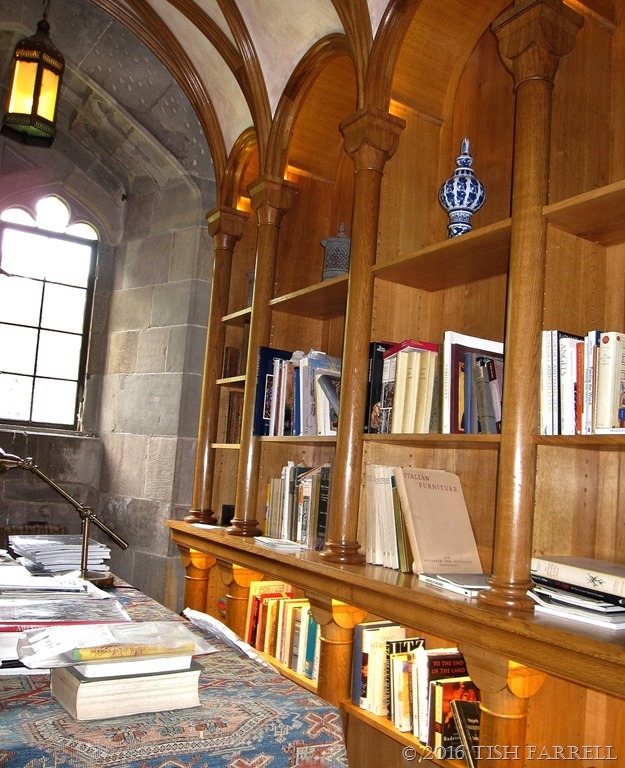 It gives a taste of the quality of the craftsmanship involved in the restoration-creation work, the newly made shelves that will house a life-time’s collection of books on art, philosophy and history. Also niggles apart, we did appreciate the gracious hospitality of Mrs. de Wet who showed us around with such enthusiasm, and then treated our party to tea and some very delicious cakes in the Venetian Room. So very English! 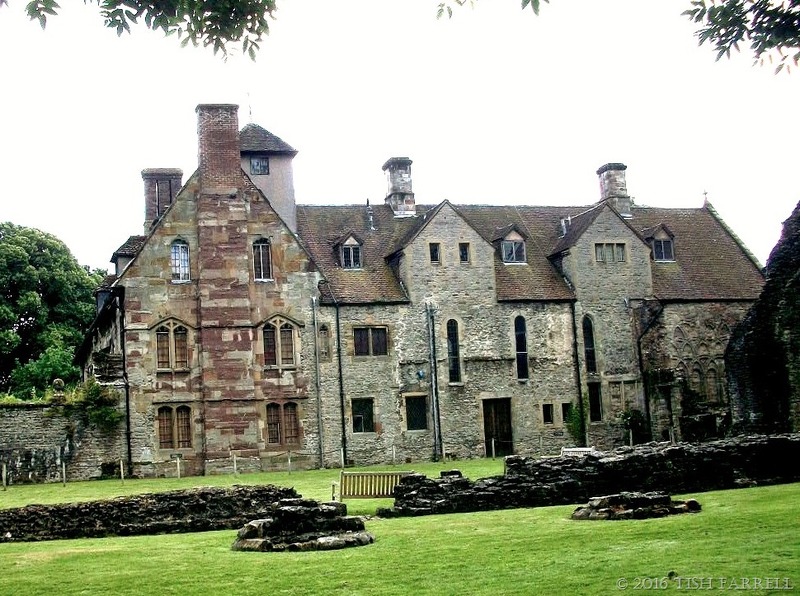 Posted on July 23, 2016 by Tish Farrell	This entry was posted in Architectural History, Heritage and tagged #HenryJames, H M Stanley, Henry Adams, Louis de Wet, Philip Webb, Tish Farrell Writer, Wenlock Priory, wplongform. Bookmark the permalink. What an amazing house and how brilliant that you could look inside. Just beautiful. Mind you, Much Wenlock as a whole looks gorgeous too. I remember going to Stokesay Castle years ago and to say I fell in love with it is an understatement. Slightly obsessed is probably more accurate. I loved the fact the hall and solar were empty of furniture so you could imprint your own ideas on the rooms. 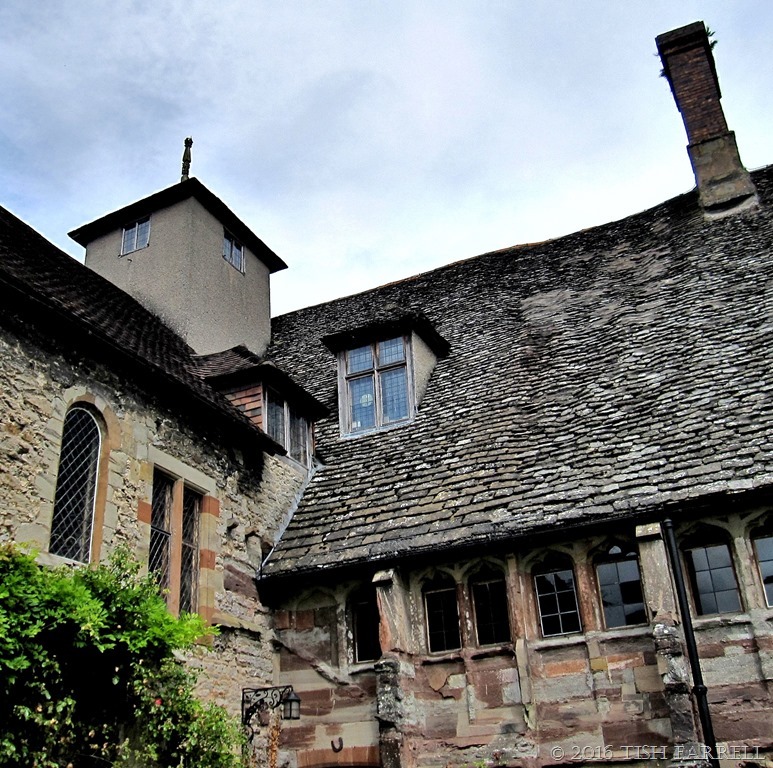 Stokesay is the most amazing place, Lynn. You’ve reminded me I need a repeat visit. Also Little Moreton Hall in Cheshire, a Tudor black and white beamed house with the most wonky floors, it has an amazing long gallery where ladies would take exercise during bad weather. I could weep it’s so beautiful. Little Moreton Hall was a place we visited often when I was a small child. I was captivated by it. I have not been back since. And Haddon too was a long ago visit that also needs repeating. I can see exactly what you like about these buildings. They have much in common, but each one has its own a very distinctive atmosphere. The old roses in Haddon Hall garden! What a wonderful portrait of a house through the ages. And why the niggle? Was it the same kind of niggle I felt being upgraded to business class I wonder? Or something very different? I always enjoy glimpses of The Master, especially when his style is not obliquely orotund! The niggle is a community one, that the house has been kept so private, which of course one understands on a personal level. But it is effectively the town’s manor house, and entry has been limited to paid, and somewhat exclusive events. The other niggle is related to the artist, but you would need to watch the film clip, wherein much might become apparent. Yes, Henry James could turn a fine phrase when in succinct mode. Lovely. Up to the Farrell standard of excellence. Kept me glued. Such a gorgeous building, Tish. I love that it is being lovingly restored over so many years. I hope my house doesn’t take hubby 33 years to finish. 🙂 I love that old door with the Norman arch. It was indeed a treat, Sue. Maybe one day it will be part of the priory again. Wow. Just “Wow!” What a place! I can’t imagine what it cost to host the king and his entourage (actually, having read a lot of history I can, but…) and I can’t imagine what it costs to restore the place. Once restored, there’s heating, etc., etc. Yikes! Thanks for the marvelous tour of both place and history, Tish. Glad this hit the spot, Janet. The restoration costs must have been phenomenal, and Louis de Wet says in the film there were times when a heating gas bill would arrive, and he knew he had no money to pay it. He would put it on the altar in the Prior’s chapel and pray. What a privilege Tish and an experience you won’t forget anytime soon. Thanks for sharing the fascinating history. Such a beautiful place… Thank you so much for letting us see the whole place from inside ….gorgeous!!!!!!! The whole place has an ancient ‘secret garden’ feel about it, and indeed there are extensive grounds and gardens that we did not see except in passing. 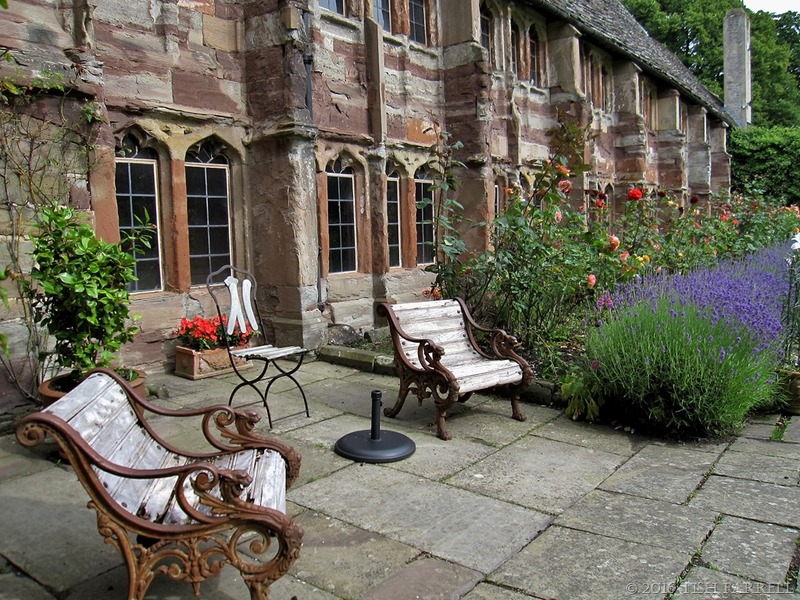 And yes – those chairs by the lavender border, just the place to settle with a good book and a cup of tea. Cushions might also be needed. 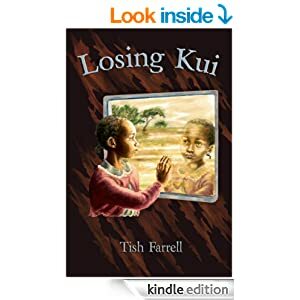 What an incredible place and history, Tish, and a fascinating read. Thank you for sharing. Glad you enjoyed this, Anna.